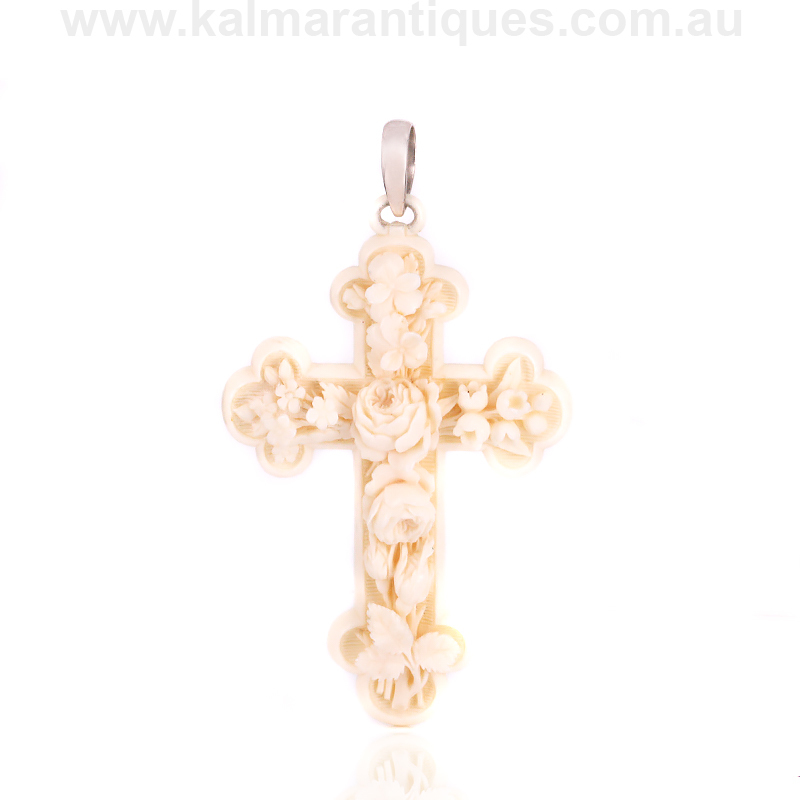 Product code: ES7727 Categories: Antique, Crosses, Necklace, Objet D'art. The woolly mammoth last roamed the earth about 10,000 years ago, and here is an exquisitely hand carved woolly mammoth ivory cross. Lab certified as mammoth ivory as opposed to elephant ivory, this not only makes it ethically sourced as hunting and killing of elephants today is of course banned, but it also allows it to be taken overseas without breaking any international laws regarding the trade of modern elephant ivory. There is no doubt that who ever carved this piece was a true master in carving and knew how to obtain the most detail because as you look closer and closer, you will notice that the carving would not only have taken an immense amount of time, is so exquisitely done. The cross measures 5.5cm across by 8.7cm or 9.7cm to the top of the sterling silver bail. With such a lovely tactile feel to it and exceptional hand carving, both combined with the character of being from a woolly mammoth, this is such a unique and character fulled piece. The earliest form of mammoth goes as far back as 55 million years ago. The woolly mammoth was about the same size as modern African elephants where the males reached shoulder heights between 2.7 meters and 3.4 meters and females reached 2.6 meters to 2.9 meters in shoulder heights. The woolly mammoth was well adapted to the cold, and this helped it survive through the last ice age. To survive, it was covered in fur with an outer covering of long guard hairs and a shorter undercoat. It had long, curved tusks which are highly prized today. Its behaviour was similar to that of modern elephants, and it used its tusks and trunk for manipulating objects, fighting, and foraging. The diet of the woolly mammoth was mainly grass and sedge and they could live to approximately 60 years old. Its habitat was the mammoth steppe, which stretched across northern Eurasia and North America.